Hi there! Today i'm gonna show you, how to create your first PhoneGap App with Android using Eclipse on Windows in a few minutes. While searching the web for a "Hello World Project" i found a lot of posts but no one had a good quality or was detailed enough, so anyone could understand it if starting by zero. So i'm trying to simplify this process as much as possible and give this know how further to you all. Pre-requisite is that you have read and done all the steps from the post: How to install PhoneGap on Windows. So i'll assume you have done those steps and are ready to start. Go to PhoneGap and download the newst version of it and unzip it in any place you want. 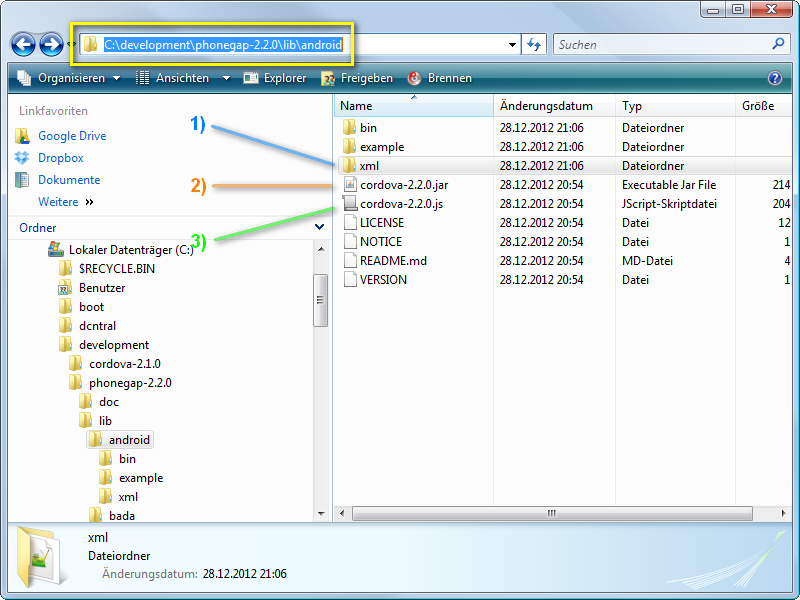 (at the time i wrote this post it was PhoneGap 2.2.0) I recommend to unzip it in the development directory C:\development as described in the post How to install PhoneGap on Windows. You should see a structure like this bellow. So before going ahead lets do some changes here. 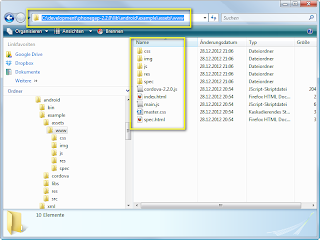 Select the folder phonegap-phonegap-8a3aa47 and press Ctrl+X, go into C\development and paste it here with Ctrl+V and rename it to phonegap-2.2.0 so that you have the new structure as shown bellow. 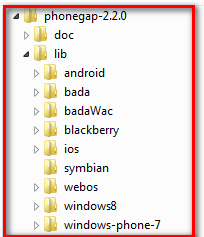 After that delete the empty folder called: phonegap-phonegap-2.2.0-0-g8a3aa47. Thats the result if everything goes fine. At this point this App is still a plain java project. We will change it now to a PhoneGap App in a few minutes. Don't worry about the App name or other properties at this point of the post. We can change everything if we want. Let's keep the focus on the really important setup things we shall know. Copy now the point 1) 2) and 3) in the project structure the way you see bellow. 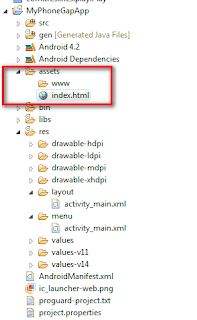 Ok now copy paste this HTML-Code into the index.html file we've created in the assets-folder. Select your MainActivity.java file and run it as Android application. 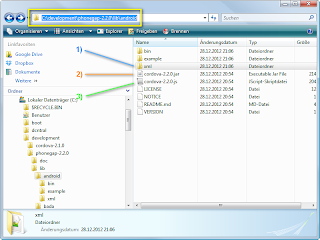 (make sure you've an AVD installed as we have seen in the post How to install PhoneGap on Windows) If everything goes well you'll see that picture bellow. Thats all. From here you can now develop your app further. 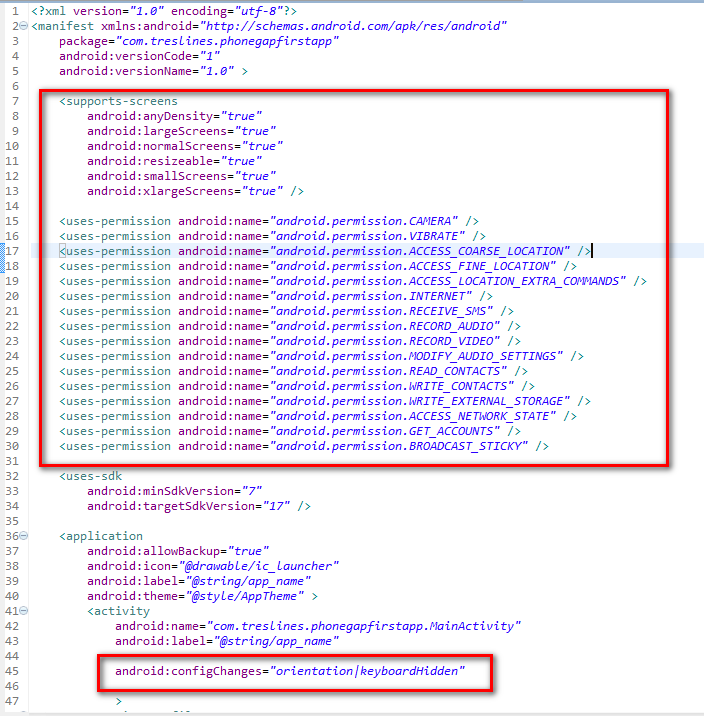 Another good short-cut the youtube video PhoneGap Android Tutorial. That's all. Now let's develop some "real" PhoneGap Apps. ;-)) Have fun! 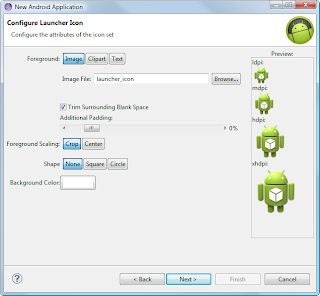 Thanks for helping me to create my first PhoneGap app for Android. This is really an amazing post. Really nice blog. I loved the content of your blog. I daily search articles and study for a web design company. I found your blog useful and interesting. Thanks for posting. What should I change in the "Prepare the Activity-Class"? You mention that you "leave the comments so you can see what I've changed" but I think there's a mistake, since I'm not able to see any comment on that section. 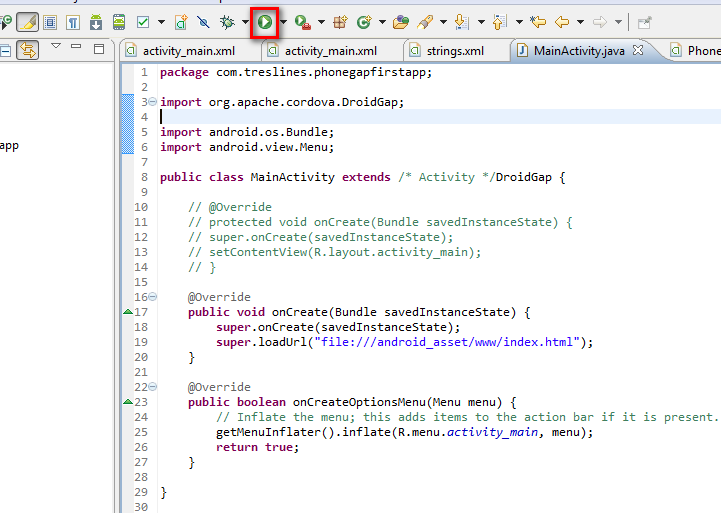 If I copy&paste directly the code into 'MainActivity.java', I get dozens of errors. So I suppose that's not the code we must paste into 'MainActivity.java', right? 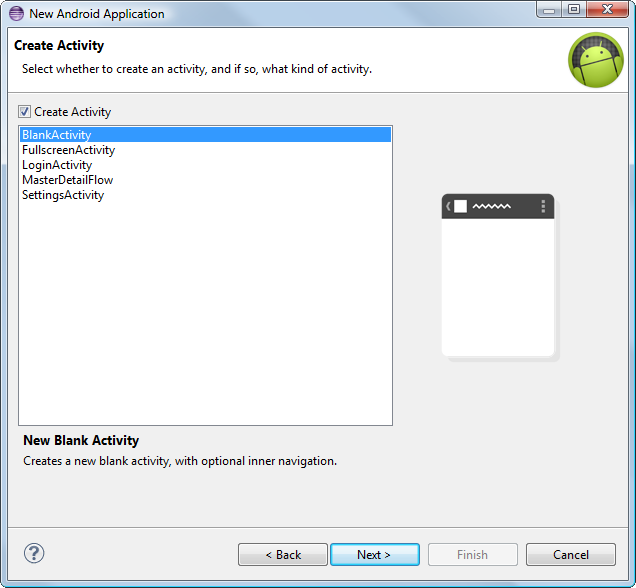 /* Activity*/ and the next paragraph so you can see what have changed from the original Activity class before going to be the DroidGap class. To remove the errors you may get, press Ctrl+O to organize the needed imports, if you have done all the steps before. This should help. Mot that it works now, but at least it doesn't give Java errors. 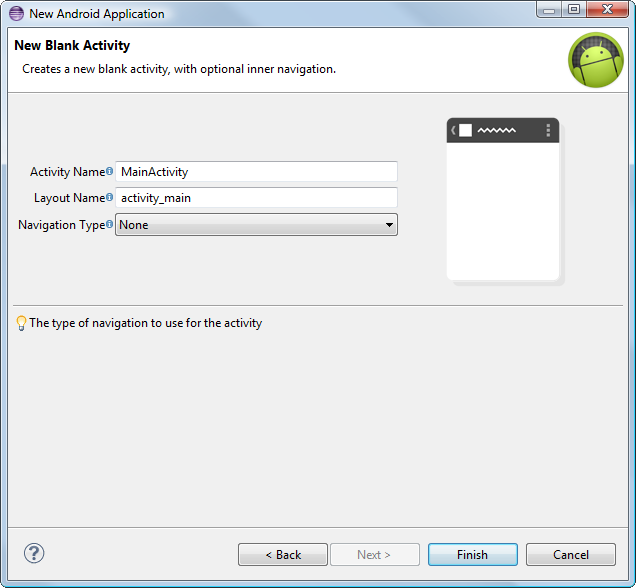 one problem in my application..script code is not working properly alert box is not coming when start my app.. There is no activity_main in R.menu..
yea your right There is no activity_main in R.menu..
i changed to R.layout but still i didn't executes script i don't know why..
can you explain clearly cause i am new to this.. It is true that there is no activity_main in R.menu.. But still the alert box is not opening. Can you please explain why? I think Tahir Mahmood is also having the same problem. This helped me, you saved my life after giving up. I am very pleased that it has helped you. You're welcome! Have fun! Unfortunately, I'm currently developing pure Android projects at the moment and therefore the focus of my work has shifted somewhat. 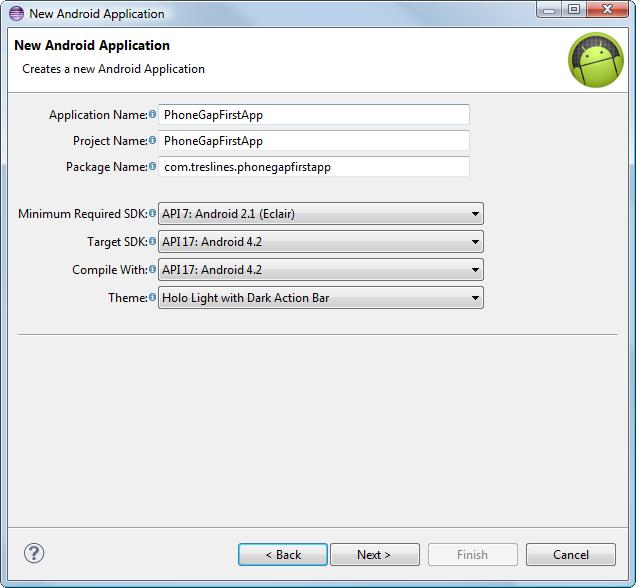 But as soon as I find time, I will come back to the PhoneGap development, because it interests me a lot. But your error seems nothing to do with the SetUp right. hope you get a solution for it out there. 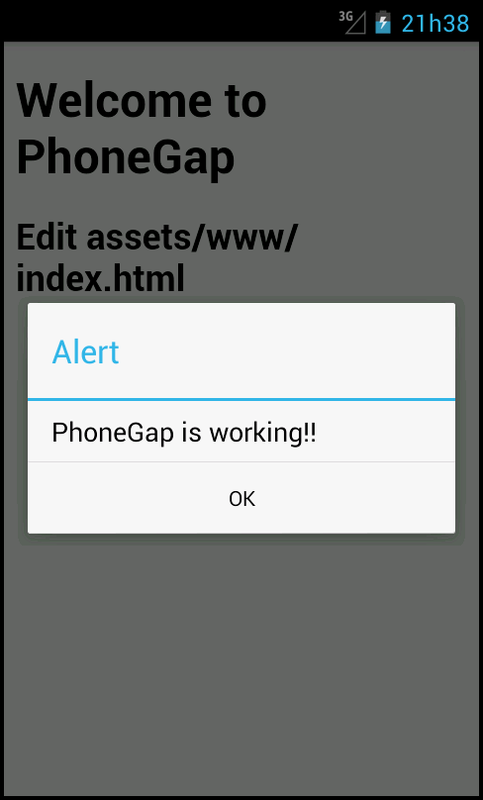 Great head start to creating a Phonegap application. Very clearly explained. I was looking for a way to understand how to develop applications using Cordova; your post have been really helpful to me. The linked video tutorial is a real help too. How to call java methods in html or js...? how to clear it? help me pls.. Thanks a lot for this tutorial. I did every thing as per the instructions but instead of my index.html contents, I am getting "Hello World!" message. 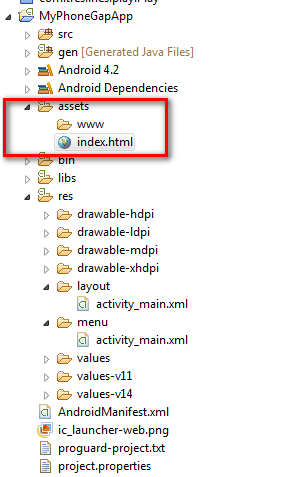 Under www folder I have placed index.html and an assets folder containing css and js files. Sorry it is my mistake. 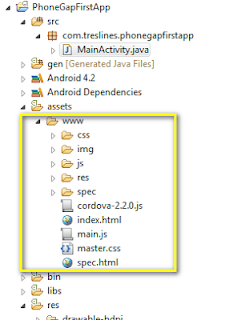 I did not change the MainActivity.java file content. 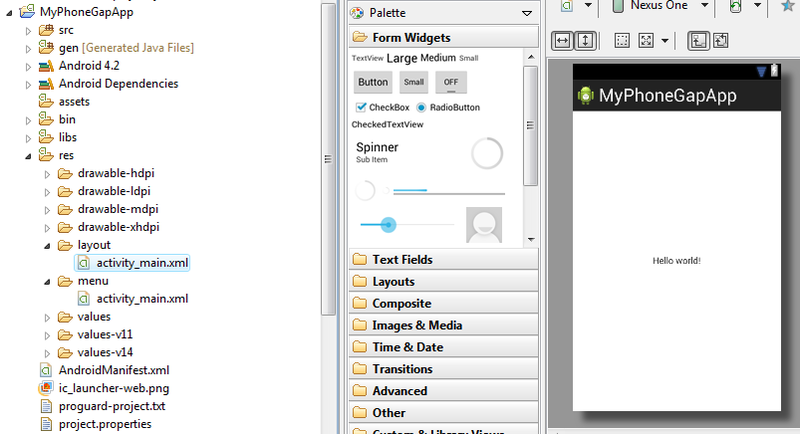 This all some people need to start developing mobile apps with HTML5. Do I have to make the same process for every app? Hi,, Thank you so much..
i realy learm from this tutorial..
Great job. Its was helpfull. Thank anyway for the tutorial! Very elaborative and helpful, thanks for putting every minute details. "Error : initializing cordova:Class not found." I get the same error as Purav. Please help! 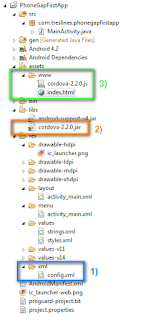 make sure you are using the right version of cordova while copying the file index.html then it should work! I got some error regarding missing plugins.xml file. I placed the file in res/xml. 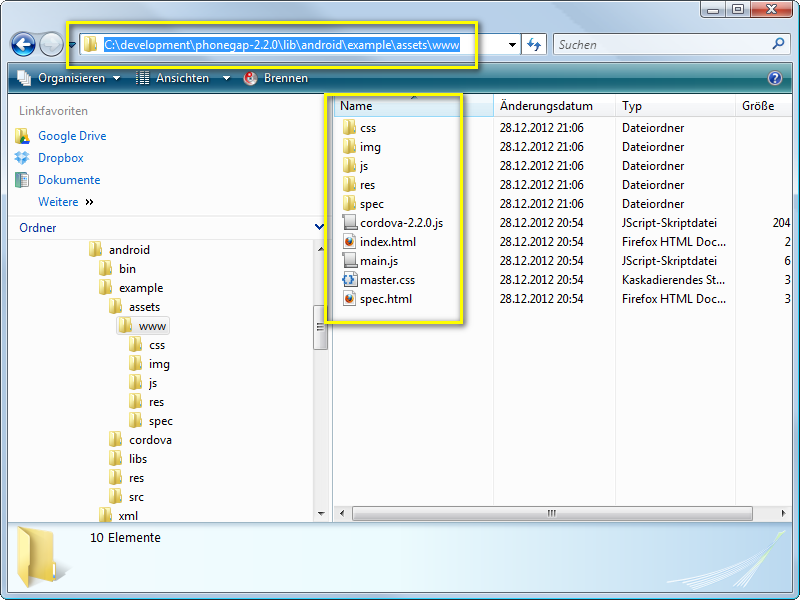 I also had to move config.xml file to same folder as it couldn't find it. It works now. Thanks you for your help! 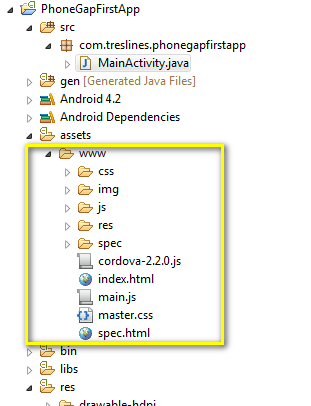 Make sure your MainActivity.java file extends DroidGap. Thank u. This Artical helps m.
Thanx a lot for this helpful post. Its great for a beginner. It hardly took me 5 mins and all done so easily. !! 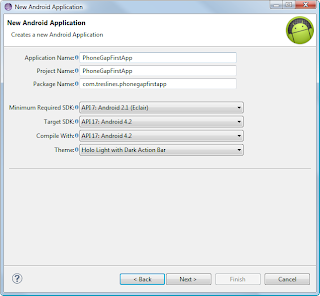 PhoneGap is something that let's you develop cross-platform applications without any difficulty. 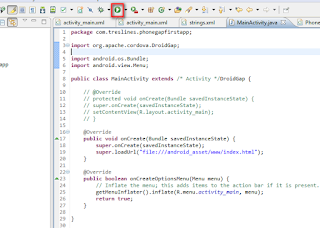 You just have to write one code and then within minutes you have applications for all mobile platforms. It is that easy! I can talk about PhoneGap and not Sencha Touch, I always follow PhoneGap because it is easy to use and reliable. You will do nothing but write code once, and within few minutes you will get mobile applications for all the major platforms within minutes! Amazing tutorial. Thanks a lot. 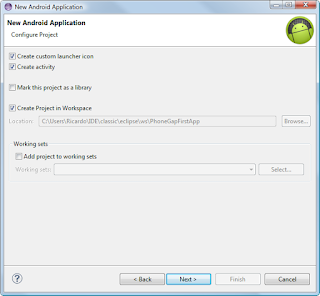 This will help those people who want to start developing mobile apps with HTML5 and android. I want to download the phone gap application, your information very useful for me, i had bookmarked you blog for further posts..
Really Amazing ... I have never Aspected To do so,Today I am able to do. I am really happy.. 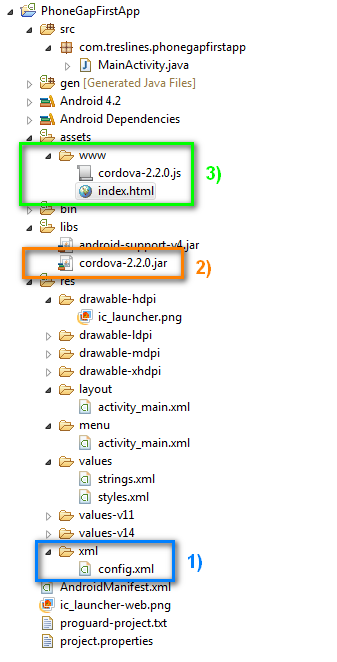 I couldn't find cordova.jar, cordova.js and xml directory in my C:\development\phonegap-2.9.1\lib folder. Please help me! I've done all the steps, but when I run the project I can not see anything on the screen of mobile device is white and I can not see. I hope someone can help me, Thank you. Videocon and stay in touch with your Contacts, Friends, and Loved ones. Seamless Roaming across India. National Roaming is Pre-Activated on Videocon Prepaid Connection with Zero Monthly Rentals. Go upmarket, again and again. Year after year, since Huawei has decided from the onslaught of Europe and the US, the Chinese firm has continued to offer phones better and better finished. Now it is assumed that the phones of the company are made of aluminum, aligned ancestral tenors, time is differentiation. The proof with our P9 which differs from the mass by the presence of two sensors picture. This is the point on which <a href='http://mobilesphone.info/' rel='dofollow' target='_blank' title=' Huawei P9’> Huawei P9</a> set to sell its smartphones. The firm does not mean forgetting its aesthetic fundamentals. upmarket forces, as is the trend of the brand, the price goes up slightly compared to last year. He must now pay 549 euros to get the subsidy without its operator with 32 GB of storage. The value which Huawei has accustomed us is it always the rendezvous? Response in this test. Nice and really very helpful blog for mobile application development. Very nice indeed. But as per now i believe the Cordova has been upgraded. 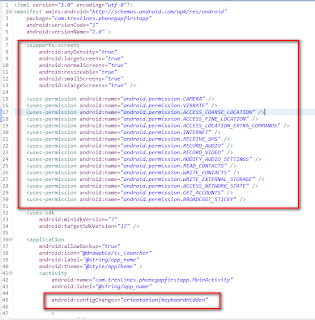 And loading these contents to the playstore could result to vulnerability security issue. Is there a way to work around this issue. 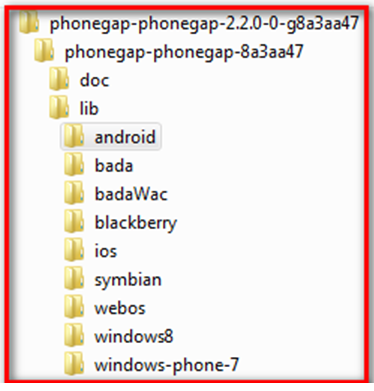 Basically how would you do an Android App using phonegap given that there are no more Jar files being introduced by Phonegap or Cordova team. If you have tried it out and it worked, How did you do it. Thank you for this valuable information,Nice and really very helpful blog for mobile application development. This post is really helpful for me. I'll surely do in the same process the way you told. Thanks you so much for this blog. You explained in very well way, newbie can also easily understand these steps. Your post is very informative.Thanks for Sharing article about Application Development. We are one of the most trustedAndroid Mobile App DevelopmentandIOS application development to meet your business complex requirement through offshore world. Thank you for sharing such an informative information with us. Keep on sharing the blog like this. We provide Digital Marketing Services and we have high conversion rates. We help our clients significantly increase the number of customers in the shortest amounts of time. We are the Top Mobile Game development Company in Noida , our Apps development gratify the idea of your Business. We convert your Business ideas virtually, into a superior form of Application. With all our high tech features and beautiful graphic designs, we have full stack engineers, who develop best mobile applications that work perfectly without any trouble. NISM Series 8 : Securities Markets Foundation Certification Examination is for entry level professionals, who wish to make a career in the securities markets. .This examination may be a voluntary examination. The nism series 8 : Securities Markets institution Certification Examination is for entry level professionals, UN agency would like to create a career within the securities markets. Stores of an obligation of appreciation is all together for this post.I think it is a better than average post. It helps enormous quantities of us. Such an expansive number of a bounty of a debt of gratitude is in order for this information. Stores of a commitment of gratefulness is all together for this post.I think it is a superior post. It helps huge amounts of us. Such a broad number of an abundance of an obligation of appreciation is all together for this data. GREETING DEAR ..Stores of a responsibility of thankfulness is all together for this post.I think it is a prevalent post. It helps immense measures of us. Such a wide number of a wealth of a commitment of thankfulness is all together for this information. Hello DEAR...I think it is a predominant post. It helps colossal measures of us. Such a wide number of a wealth of a commitment of thankfulness is all together for this information. In such a way, I never comment on anyone's blog, but whatever you told us in your blog, it was good to me that your Thank You so much for sharing such an idea. Hi DEAR..Thanks for sharing this post.I think it is a transcendent post. Such a wide number of an abundance of a dedication of appreciation is all together for this data. We Are Dolphin Automation and Technology get in touch with us for Mobile Signal Booster..